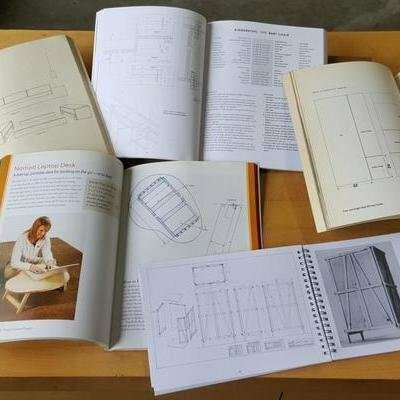 After detailing the final steps of the project of making a dresser, the anonymous author of Joiner and Cabinetmaker describes how cabinetmakers would use veneering and other techniques to set off the dresser to a different level of work. Such was the distinction between joiners work and cabinetmaking in the eighteenth and nineteenth century. Cabinet work was veneered and decorated, whereas joiner's work was not. In professional work this is no different today. 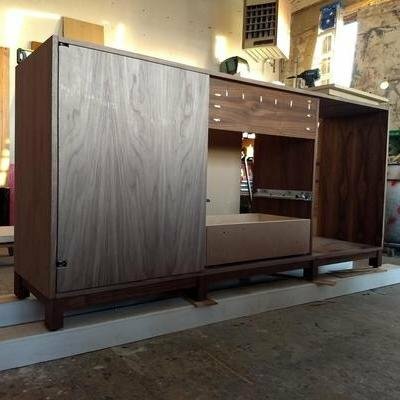 The low-end carcass will be melamine and the high-end Italian carcass will be birch plywood, possibly with some exotic veneering. The more expensive you go, the better hardware and joinery you get. But unlike furniture of previous centuries, today's Ikea doesn't look that different than higher end brands like Herman Miller to the average customer, especially without scrutiny or use. In my opinion, this is one of the fundamental reasons why furniture has declined as a measure of conspicuous consumption and status. In the early days of the United States, hardwood was plentiful and much furniture was made from Oak, Ash, Birch, Maple, Walnut, and Cherry. Yet Duncan Phyfe, the great New York based 19th century cabinetmaker, based his work on high quality imported Mahogany. This of course makes no sense if you look at furniture from a modern perspective, in which form is the most most important aspect. 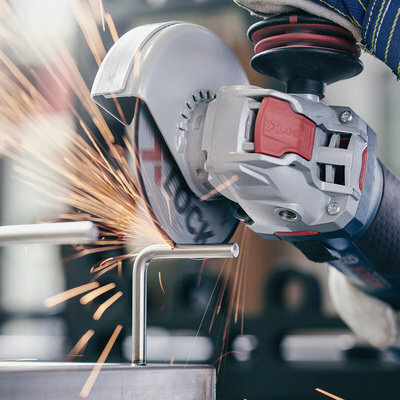 But it makes a great deal of sense when you consider the importance of marking the distinction between joiners work and high-end cabinet work, for which you want a premium. You have to use fancier materials. Before the American Civil War, after which factories began to churn out facsimiles of rich people's furniture, the middle class and the poor bought joiner's furniture and Shaker furniture. Windsor chairs were also the standard common chair. The upper class (and upper middle class) bought veneered, decorated furniture, upholstered and carved chairs, all of which served to show off their wealth. The hand tinted color plates in Manuel du Tourneur by L.E. 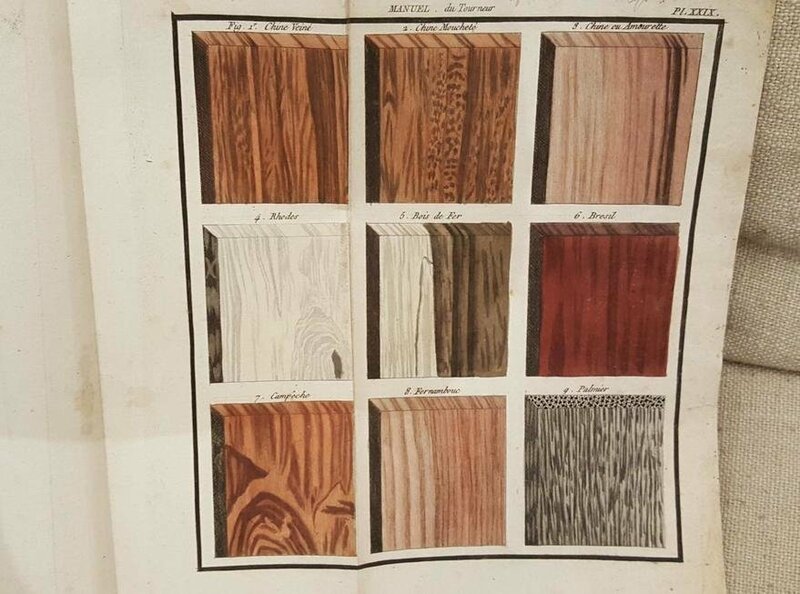 Bergeron (1816), showing exotic woods and materials that were used for (luxury) inlay, marquetry, and turning. The trees were cut down* long ago and the Cuban Mahogany that Duncan Phyfe was so fond of is no longer available commercially. American Black Walnut, which once covered the east coast in the 18th century, is now nearly an exotic wood. The bulk was cut down for charcoal to feed the iron furnaces of the early American iron industry. The other common cabinet hardwoods are available but expensive. Laminated woods have been used for centuries but it is only in the twentieth century that plywood has become ubiquitous in furniture. First plywood, then all sorts of laminated sheet goods became popular. Proper cabinet grade plywood is now a symbol of quality. Melamine, fiber board, particle board, and all sorts of sheet goods are currently being used. In general, custom builders - both amateur or professional - don't use lower end materials much in furniture construction (other than kitchens) so I will ignore the materials of mass production. As we see from historical examples, in order for furniture to be perceived as "special" it needs fancy materials, finishes, and detailing. Nowadays the meaning of "exotic materials" has expanded considerably to include all sorts of material, including spalted wood (wood that has been colored and discolored by fungal growth) and wood with interesting grain patters caused by genetic mutations (bird's eye or tiger maple). Solid wood itself is considered sort of exotic. Guests in my home have sometimes complimented my furniture (made of solid walnut) then asked questions or made comments that made me realize they saw no real distinction between a walnut finish and solid walnut. For them, all wood was naturally beige-tan, so "walnut" meant an added color. Of course most of the exotic materials of the past are no longer available because of extinction or bans on importing to prevent extinction. Another reason these materials I think are less common is that most people cannot tell the difference between ivory, ebony, and white or black plastic. We are so used to seeing the roaring figure of exotics copied in artificial materials that the real thing is much less of a standout. What has gotten extremely popular is the use of reclaimed materials and we will be seeing more and more of that as time goes by. Reclaimed materials are being used three ways: as inexpensive secondary woods. This has always been the case, nobody in their right mind would toss a nice piece of wood staring at them in the shop. A second use of reclaimed lumber, and possibly the most popular usage, is to take large beams and other wood from older structures and re-mill them so that they can be essentially reused again as new material. The advantage is that we get access to old growth wood and materials which are simply not currently available. 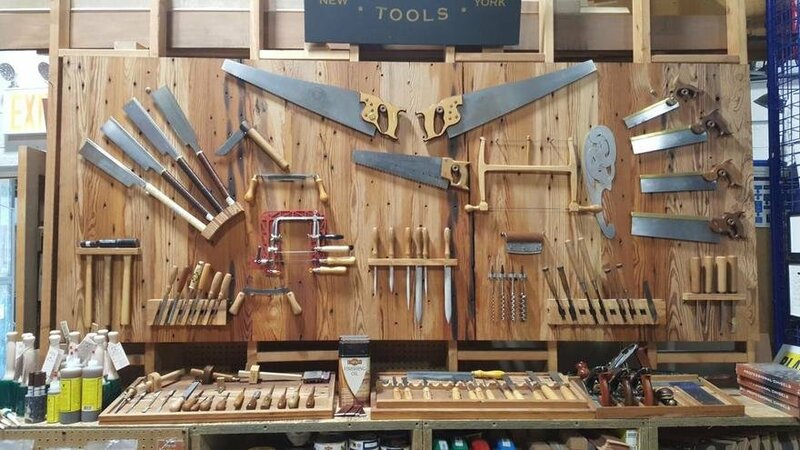 In our shop our display board for our tools was made our of reclaimed pine that originally was in a whale oil factory. The pine is dead hard, dead straight in grain, and oil impregnated. It's wonderful stuff. I see flooring and other woodwork routinely made out of reclaimed lumber these days. The final usage of reclaimed lumber is the most interesting. We recently held a book signing with Yoav Liberman in honor of the publication of his new book, "Working Reclaimed Wood: A Guide for Woodworkers, Makers & Designers." The reason Yoav's book is so interesting is that reclaimed lumber is increasing is used as a material in its own right. The wear and tear of the previous uses are left in. The reason the material is used is not because it once was a wonder bit of wood, it's being used because it shows its own history. This of course opens up a high avenue for design and exploration and gives the maker a wide choice of materials made unique and interesting because of past usage. And as I said previously success in high end furniture has always been about demonstrating something unique. Solid wood furniture can be detailed with carvings, but solid wood is also a very variable material. 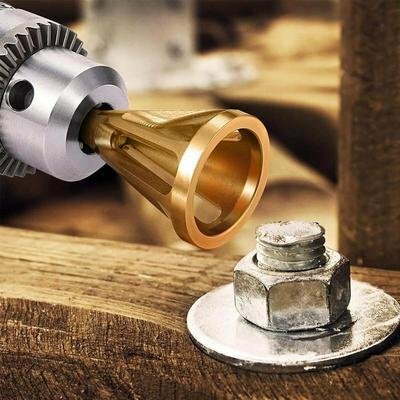 Surface treatments and finishing deserve their own blog entry. *If you want to read a gripping story of the lumber camps in Mexico where Mahogany was harvested I heartily suggest B. Traven's Jungle Series. The last few books take place in the camps, although the entire series is wonderful. Our tool display made from reclaimed pine.